P-8As for the US Navy on Boeing’s mission systems integration line for the aircraft, which is adjacent to Boeing Field, Seattle. 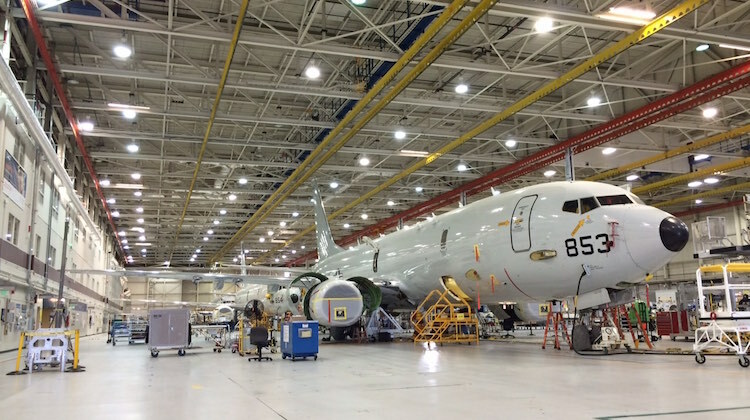 Components for the first Boeing P-8A Poseidon maritime surveillance aircraft for the RAAF are already in production ahead of the aircraft’s first flight in mid-2016, Boeing says. The fuselage for the first RAAF P-8A, dubbed ‘Aussie 01’, should arrive at Boeing’s Renton factory to begin final assembly by early 2016, James Detwiler, Boeing Military Aircraft’s director of business development for maritime projects, told Australian journalists in Seattle on Monday. “We’ve already begun production on the first aircraft. Aussie 01 is in production right now in a very long-lead advanced procurement state,” Detwiler said. That would lead to a first flight in “mid-year 2016,” Detwiler said. The Australian government announced approval of the RAAF’s acquisition of eight P-8As with options on a further four in February 2014. The first Australian aircraft is due to be delivered in early 2017 and all eight are expected in service by 2021. Prime Minister Tony Abbott said at the time that acquiring the four optioned aircraft would be considered as part of the new Defence White Paper, which is due to be released in coming weeks. To date Boeing has delivered 27 production P-8As to the US Navy out of a requirement – project of record – for 117. Fifty-three P-8As have been contracted for under low rate initial production (LRIP) batches 1 through 4 and the first full-rate production batch. Currently Boeing and the US Navy are finalising contracts for full rate production batch two and long-lead items for full rate production batch three, which will include all eight Australian aircraft. A contract for long-lead items covering the first four RAAF aircraft was signed last August. So far India and Australia are the only confirmed P-8 export customers – but Detwiler said Boeing anticipated that further international orders would take total P-8 production beyond 200 units. “We’re looking at numbers that would bring a fleet size in the 200 ballpark, maybe more,” Detwiler said. India is acquiring eight P-8Is, a variant of the P-8A featuring a different communications suite and a digital magnetic anomaly detector (MAD). Seven of the eight Indian P-8Is have already been delivered. NICE & 4-6 TO REPLACE RNZAF P3K’s WOULD BE GOOD! India and Japan are acquiring P8Is and Kawasaki P1s respectively with MADs to patrol the Indian and Pacific Oceans. Why does the RAAF think we no longer need a MAD capability in the same AO with an undersea threat of increasing target boat numbers to be detected, tracked and neutralised? I didn’t realise either, until I read the last paragraph in this article, that there was even a possibility that RAAF P-8’s *wouldn’t* have a MAD. Why wouldn’t they? A good question to ask is, do / will USN P-8’s be equipped with a MAD? At least Flight Engineers in the German Navy will still have a Job for a while – as unfortunately glass cockpits do away with those highly skilled individuals..
USN P8As are not being acquired with MADs. They are an FMS option that India chose when it ordered their P8Is. So is the MAD considered to no longer be required for maritime surveillence aircraft, or are there better methods of detection with other equipment the P-8A has onboard? Paul, Since when does Aust make acquisition decisions on behalf of NZ – I think they would see Aust as being very arrogant/high-handed again!! The US has stated that the MAD probe is being replaced by “classified” alternative technology. Countries who believe – such as Aust – are going along with the US stance, Others – India & Japan with Kawasaki P1’s – , who are more sceptical are including the MAD stinger/processor anyway. There seems to be a slight, but perceptible move in detection priorities away from the traditional ASW methods to more of a rounded ISR capability – to which the Aust AP3C’s (with their enhanced range of sensors) were used to great effectiveness in the middle-east in recent times..
An upgraded version of the Orion (Orion 2000) was offered as an alternative to the boeings, but lost out supposedly because of greater upgradeability potential with the P8’s. The operational doctrine or the P8 is high altitude with excursions to sea level only when necessary, due to the inefficiency of turbofan engines at low altitudes, whereas the turboprop Orions were close to sea level as normal as turbprops are much more tolerant of low altitudes and where the MAD detector is most effective.